The horseshoe motif is a fashion classic for the horse lover. 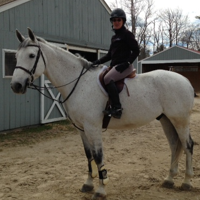 Horse shoes are said to be good luck – and who doesn’t need more good luck in their life? – as well as neatly communicating your passion for all things equine. This week, we’re going to look at some of our favorite gold horseshoe jewelry. We had three criteria in mind when we put the list together. We wanted gold horseshoe jewelry you could wear every day, we wanted gold horseshoe jewelry that was distinctive and eye-catching, and we wanted gold horseshoe jewelry that was made in the USA. 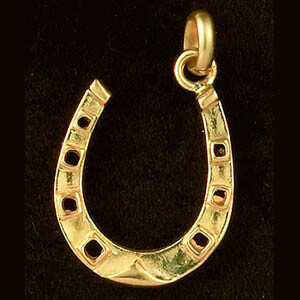 The 14K Gold Chunky Horseshoe Charm delivers on all 3 counts. 3/4″ wide by 1″ tall, the bold styling of this gold horseshoe charm makes it an excellent signature piece. It’s sized perfectly to wear every day. Makes a charming addition to a traditional charm bracelet, or wear it alone as a pendant. A fantastic gift! Another great piece of gold horseshoe jewelry features exquisite modern design. 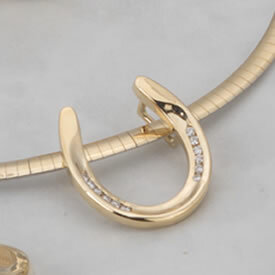 The 14K Gold Horseshoe Pendant Slide features .24tcw of diamonds sparkling beautifully. Shown on an Omega Chain (sold seperately) the Gold Horseshoe Pendant Slide is classic equestrian elegance, suitable for every occasion. You’ll love how easy it is to wear this necklace: it looks great with casual wear on or the most special evening. Made in the USA by our master craftsmen. 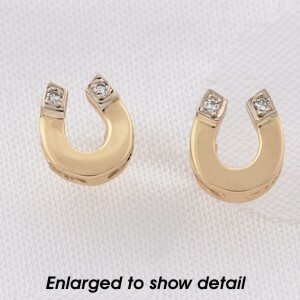 Here are some great 14K Gold Horseshoe Earrings. Petite, elegant design is easy to wear every single day. Each earring is 1/3″ X 1/3″ with a small accent diamond. These earrings are available in yellow or white gold – choose your favorite. These are many of our customer’s absolute favorite earrings, and we have to admit that we’ve been told more than a few times that they’re ‘lucky’ in the showring! The 14K Gold Horseshoe Rings are made in the USA.